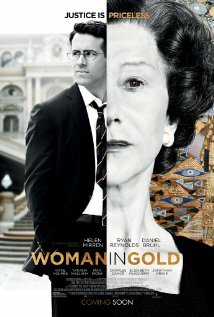 One of those real-life tales that would seem highly unlikely if presented as a piece of fiction, Woman In Gold tells the story of Maria Altmann, (Helen Mirren) an elderly Austrian-born woman living in California, who after the death of her sister contacts a young lawyer, Randol Schoenberg (Ryan Reynolds) to ask his advice about a painting – a very famous one. Known to the world as The Woman In Gold, it was painted by Gustav Klimt, was commissioned by Maria’s father and is actually a portrait of her late Aunt. Looted by the Nazi’s during the Second World War, it now hangs in Vienna’s most famous art gallery and is widely regarded as Austria’s most quintessential piece of art. What chance would there be, wonders Maria, of having the painting returned to her? The story looks at the long series of meetings, negotiations and court cases that the two leads have to go through in order to obtain justice. Mirren is on great form as the cantankerous Maria, (though it must be said that for a supposed octogenarian, Mirren looks distinctly healthy), while Reynolds, always an underrated actor, makes an adept transformation to the quietly-spoken but determined lawyer, prepared to take an entire country to the supreme court. The Altmann’s tragic history is shown through a series of assured flashbacks with Orphan Black’s Tatiana Maslany looking surprisingly convincing as a younger version of Helen Mirren. In a story like this it would be all too easy to slip into schmaltz, but Director Simon Curtis manages to keep everything reined in enough to tug at the heartstrings without losing control; and this is, after all, an emotional story of cruelty, dispossession and greed, that will make all but the stoniest individuals shed tears. A decent and absorbing film.